Father, today we travel to Ecuador where I believe You called us to serve You there through serving others. Thank You for the opportunity to work with You there. Thank You for Katie and Barb who are along to apply their skills. Thank You for Ted and Howard who will provide needed maintenance help for Jane. Father, Thank You. Your loving kindness and faithfulness are constantly available and given so generously to us. It is such a joy to know You, to walk with You and serve You. I worship You, Lord. Father, please protect us all through this trip, as we travel, in our work. Help us to be Your hands as we become extensions of Your love. Thank You, Lord! Amen. After our trip to Miami yesterday we arrived at our hotel and enjoyed some time of sitting on the deck by the pool enjoying a breeze and some shade. After dinner Katie called me to report that she and Barb arrived and were waiting on the shuttle to take them to their hotel. 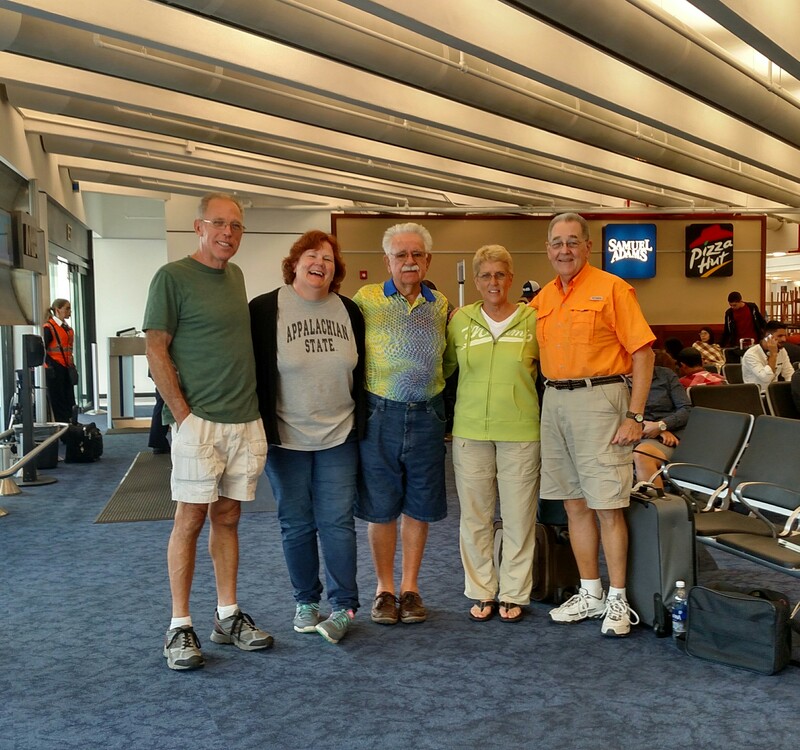 We reviewed our schedules and planned to meet at the airport this morning after checking through security. We awoke about 4 am to get ready for the day. By 5 we were in the lobby with our luggage and boarding the shuttle to the airport. Fortunately, there were no long lines and we checked in and were through security and arrived at our gate in about 45 minutes. Shortly after Ted, Howard and I arrived at the gate, Katie called me to see where we were. I told her we were at Gate E7 and she seemed to say that they were elsewhere. After trying to explain what our boarding pass said, she then told me to turn around and there she and Barb were about 20 feet behind me sitting and laughing at me. So, we then introduced ourselves and settled in for a couple hour wait before boarding our plane. This trip I am taking along 45 Galcom Envoy Digital Solar Powered players that are loaded with the entire Bible in Spanish along with a Bible study course in Spanish. Galcom International has a unique ministry in bringing the Scripture to multiple people groups around the world. With the chip technology a huge amount of data can be stored on such a small electronic chip. The player is the size of a cell phone and has a solar unit on one side that will keep the player charged. On the other side are some keys to play, stop, fast forward, fast reverse and even a button to turn on some LED lights in the one end of the player turning it into a flashlight. Galcom produces these units and loads them with the Bible in multiple languages. These are then distributed to those who don’t have a copy of the Scripture and cannot read. It is amazing how much we take for granted having probably several Bibles in our possession. The people who receive these players have no personal copy of God’s Word and are thrilled to actually have their own Bible which they can listen to at any time. In 2014 I took with me a few of these players provided by the church I attend in Englewood, FL, to show Jane. This opened up a new ministry for her in that she sees many people who are illiterate and are hungry for their own copy of Scripture. When I went back to my home church in Fort Wayne, I mentioned to my Adult Bible Fellowship class that my dream was to someday take 100 of these Bibles to Jane so she can give God’s Word to those who can’t read and have no means to have their own Bible. The members of this class got the fever, you might say. They immediately took on the challenge and in one week raised enough funds to purchase 100 of these players. In a few months they were in Jane’s hands and being distributed to the people in San Lorenzo. Then the church in Florida followed suit and earlier this year sent 100 players to Jane. These were taken to her in May when a group of college students from Ft. Wayne took them to her as they went to San Lorenzo to work with her. Prior to my trip now my ABF at Ft. Wayne provided another 45 players so I have them packed in my luggage and they are on their way to San Lorenzo. Amazing…a dream voiced, backed up by prayer and trusting God, and He provided to this point 245 players! God will gladly help people who are seeking Him by providing His Word to them. We serve and amazing God!! Our flight to Quito departed Miami on time and we arrived at Quito about 20 minutes ahead of the projected arrival time. The flight was smooth and we landed at the new airport outside of Quito. This is a bigger and nicer facility than the one downtown. A big plus for this big city! We arrived about 1:45 or so and worked through customs without any delay or questions. Even with the strange things we had packed to bring to Jane (vacuum cleaner, 50 aluminum pie pans, the digital players and several clothing items, plus what Barb and Katie brought in the way of medications and a large supply of baby wash) none of us were stopped at customs when they x-rayed the luggage. We passed on through and met Damarys’ sister, Leila, who then escorted us to San Lorenzo. She had a driver and a van so we could all travel together. The trip to San Lorenzo usually is about 4 to 4.5 hours when leaving from downtown. This time I thought we would see a shorter time because we left from outside the city. However, that was not to be. We encountered a terrific amount of traffic with heavy trucks that were creeping up the mountain road and traffic came to a crawl. Our trip took us over 6 hours with the last hour and a half in the dark. We could see why Jane does not like to drive this road after dark. Lots of turns with almost sheer drop offs at the side of the road. I was a relief to finally see the entrance into Jane’s clinic and to get out of the car and get some hugs from Jane and Damarys. A family is here from Tennessee to work on some maintenance projects for Jane. Carl and Jody, people I have met before, come most every year to spend a week or two doing various maintenance projects around the clinic. Their son is with them along with another couple and a young lady. With five of us arriving along with 5 of them made for a house full of people. However, there are beds for all of us and I am capitalizing on that right now to rest my leg. Sitting in the plane and in the car all day with little opportunity to move around resulted in edema of the right leg. Hopefully, with a good night’s sleep and keeping the leg level will help clear the edema. This edema is a result of the after effects of the Baker’s Cyst that ruptured and spilled its contents into the lower leg muscles. The tenderness has eased but the edema comes on rather quickly if I am standing or sitting for any length of time. Talking with Jane our schedule tomorrow is going to be light and we will get oriented and jobs assigned. Jane has one patient coming in tomorrow for me to see but otherwise we will spend our time just checking out the ultrasound machine. I offered my right leg with the fluid collection from the ruptured cyst to practice with the ultrasound as it should pick up the pocket of fluid easily. Father, it has been a long and tiring day. Yet, You have been with us continually and I felt Your encouraging presence several times today while creeping along in the traffic and on the plane. Thank You for that. When You give me that encouragement I reminds me that You will never leave me or forsake me as You promised Joshua. That is so reassuring. Lord, this next week and a half will hold some different work for me than I have had in the past. I still marvel at how You brought Barb into the picture when You knew that the operating room was not workable. I didn’t know that but You had it all figured out so our time here was not wasted and we can give Jane some valuable training on using her ultrasound machine. Lord, we are here to serve You and that we intend to do. Thank You for leading us here and for working out all the details so we could travel without any problems or interruptions. Thank You that all our stuff came in the luggage without any questions or problems. Lord, I believe You take delight in the little details just so show me that nothing is impossible with You. I lean on You and trust You with all my heart. Lord, Your unending love is absolutely incredible. Thank You, Father! Amen.